A Fabulous Getaway at an Award-Winning Iconic Resort! Did you ever wonder why many tourist flocks to Malaysia while us Malaysians opt to travel out? Sometime we are too busy admiring the other side than to notice the beauty on our side. A few weeks ago, I discovered another gorgeous side of Malaysia, just within an hour plus away from our metropolitan city. Port Dickson, a coastal town just over an hour away from Kuala Lumpur, would never be on my list of places to travel. Well that certainly changed. 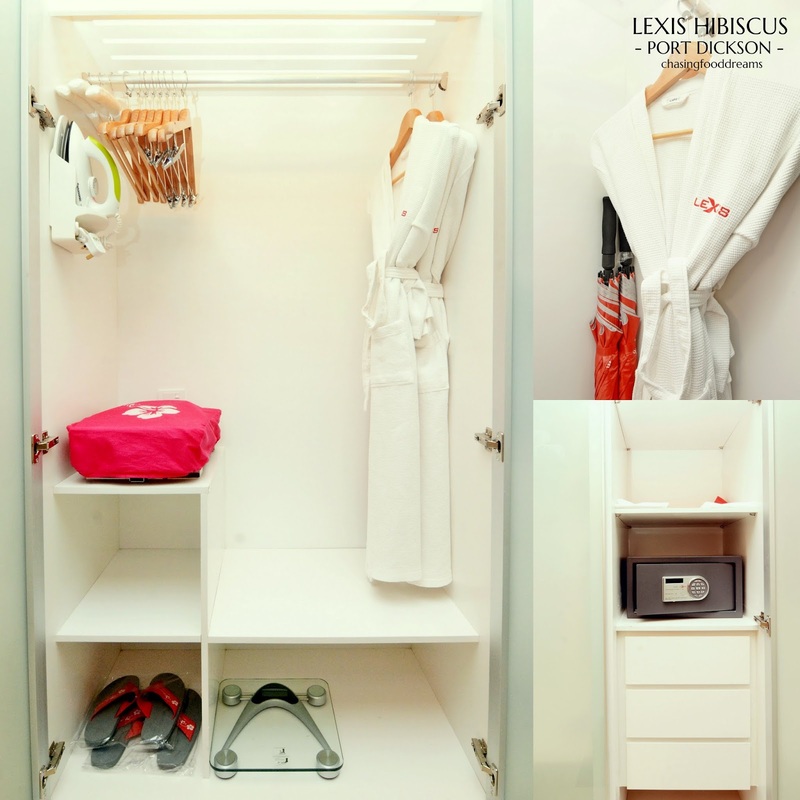 After an amazing getaway at Lexis Hibiscus Port Dickson recently with my family, I couldn’t wait to go back there to the iconic resort again. It began with a vision of a bud blossoming into reality of a gorgeous hibiscus bloom that spreads into the waters of Port Dickson. Barely a year old, Lexis Hibiscus Port Dickson has already garnered enough attention from international waters to make its mark as an award-winning iconic resort. With water villas that stretches to almost 1.2km from the beach to the furthest unit at the Straits of Malacca, Lexis Hibiscus water villas form the signature hibiscus bloom that is easily recognizable at a glance. Set along the pristine Pasir Panjang beach, Lexis Hibiscus is the perfect getaway for many who seeks a short or long getaway from the hustle and bustle of city life. 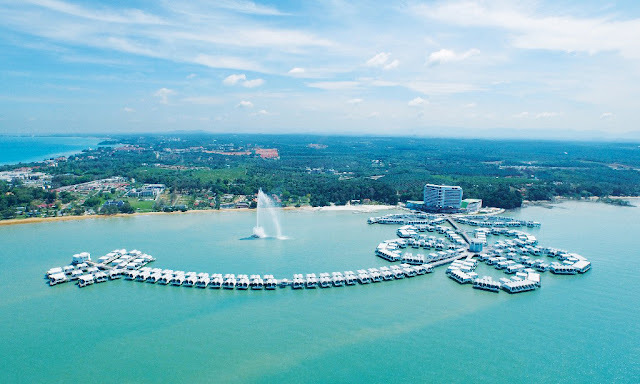 The tranquil retreat is magnificent in many ways and the panorama view of the Straits of Malacca is unbelievably surreal. 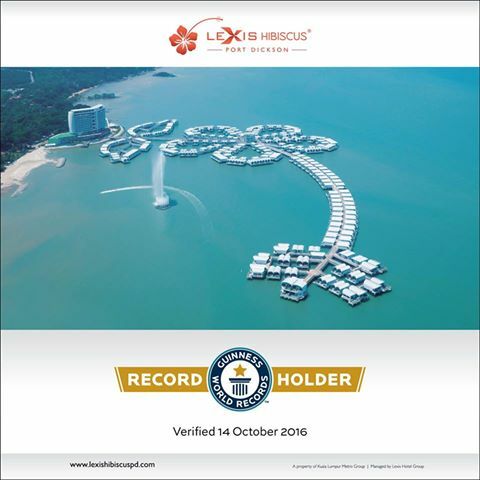 On October 14, 2016, Lexis Hibiscus Port Dickson became the proud record holder of Guinness World Records for achieving “The Most Swimming Pools in a Resort” and “The Most Overwater Villas in Single Resort”. 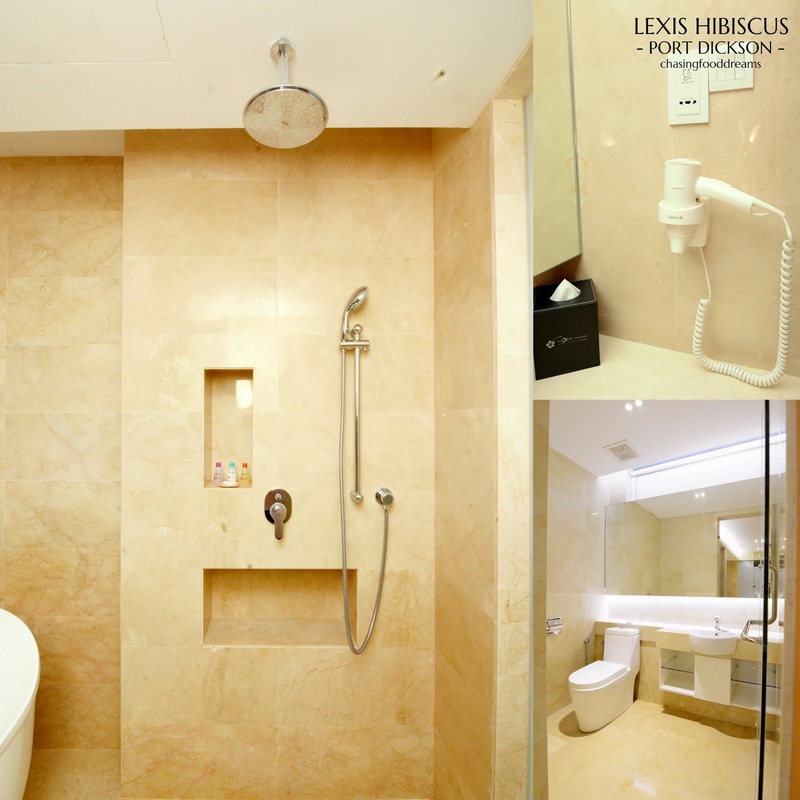 In addition, Lexis Hibiscus is also the recipient of the coveted World Luxury Hotel Awards for having won the Luxury Water Villa Resort (Southeast Asia) Category. 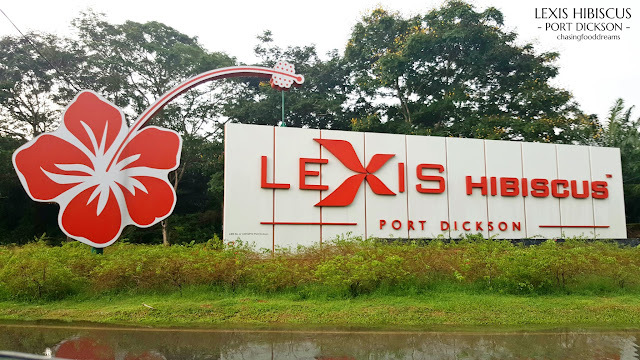 While many may not be aware, the Lexis Group manages three properties in Port Dickson – Lexis Hibiscus, Grand Lexis and Lexis and one property in Penang – Lexis Suites Penang. Their concept is one of the first to offer units that is spacious enough to accommodate at least two king size bed as well as a private dip pool and a private steam room. The avant-garde Lexis Hibiscus has a stellar collection of 639 pool villas, comprising of 117 tower rooms and 522 striking seawater villas. Every unit is amazingly spacious and design with pure comfort in mind. We check-in on a Friday and the resort was already bustling with much activities and guests. 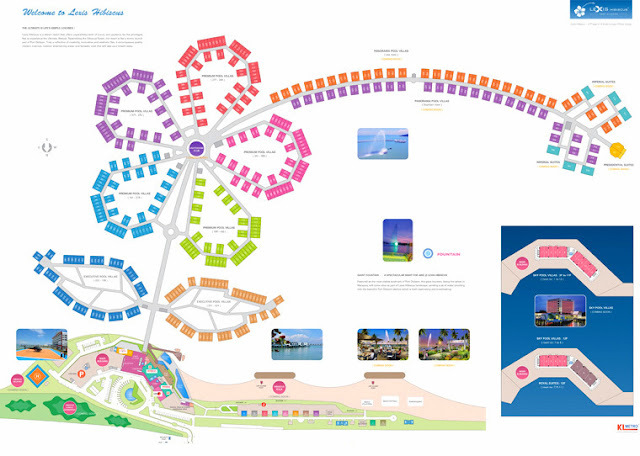 There are eight options of units to choose from with the cheapest located in the main building of tower rooms to the leave of the hibiscus. As the villas goes deeper into the waters, the view turns more scenic as well as the privacy. We had the opportunity of staying at the Panorama Pool Villa with Sea View. Located at the long stem of the hibiscus, it was a breeze to check-in. Whisk into the Buggy Service Area, we were to check in at The Lighthouse Club. The Lighthouse Club, located at the middle of the petal, is a beautiful glass-clad circular building that caters to guests staying at the Panorama Pool Villas and the Suites. Think of this as the Executive Club Lounge where exclusive guests at these villas and suites are treated to a private and upscale level of service and dining. Needless to say, check-in was quick and since it was just in time for the cocktail hour that comes with our room, we headed straight up to the third level where Lighthouse Bar is. Guests staying at the Panorama Pool Villas and Suites are offered complimentary small bites, cocktails and wines every day from 5pm to 7pm. As it was Friday, there was really minimal guests and we all sat down to unwind after our drive. The weather was slightly damp and we could see the evening’s sky slowly turned dark with gloomy clouds through the glass walls. Since there was no sight of sunset, I settled for a Tequila Sunrise! The small bites were served at our table with our cocktails. From savory to sweet, there’s mini burger, hotdog, sandwich, cakes, profiteroles, fruits and more. There is even a children platter for my little one of fish fingers, potatoes wedges and samosa. After our cocktail treat, we took another shuttle to our room, smacked right in the middle of the stigma of the flower. As soon as we enter our room, we glanced in awe at the spaciousness of our Panorama Sea View villa. 926 sq. ft. of space, cleverly section into two long areas of the sleeping area and the bathroom, was totally unlike any of the hotels or resorts that I have stayed at. There is a small hallway that has an area of cabinets when we enter. The small hall has the signature hibiscus set in tile to remind us again of its concept. The beds, two King size ones, are covered in pristine white sheets and brighten up with colorful pillows and bed scarfs embroidered with Lexis logo. The room’s earthy and warm tones exude a coziness that welcomed us warmly that evening. Even the LCD television is cleverly incorporated into the wall panel to offer a seamless and spacious design to the room. A work desk is set against a wall with all its necessary work elements such as electrical power points, Internet connection, hotel stationary, brochures of information and more, all set on the long marble desk. Next to the beds are bedside nightstands that has modern contemporary lamp shades, phone, alarm clock, and torch light. There is also a single arm chair in dark velvet blue in one corner of the room. When I notice the ceiling fan, I added another plus point to my list of advantages of the resort. Not many hotel offers fan since there is air-condition but I really like my room breezy with a good whirl of air-circulation, just like my own bedroom in my house. Notice the top dark panels of glass above the beds? One can control the electric shade to cover these up to keep the room dark or simply allow Nature’s light to brighten up the room in the morning. My little boy was literally jumping with glee as soon as he discovered the private pool. It was already dark when we finally check in after dinner so the private pool looked mystical and inviting with its dark glow. For a little romance, couples would definitely enjoy a dip in the evenings for a little tête-à-tête! Here is the private Steam Room we took during the day as it was too dark to show it during the evening. The bathroom is bigger than my bedroom at home. Offering bathroom privacy at one end, the hallway of the bathroom has a large cabinet that holds a safe deposit box, an ironing board, laundry services amenities, umbrella, a weighing scale and slippers. Beside the cabinet, there is a large space for luggage. There is a glass panel on the floor to allow us to catch some marine life below the waters too. Our bathroom has a ‘His and Her’ sinks and large counter space with large mirrors. There is the usual bathroom amenities along with white and blue towels embroidered with Lexis logo. A hair dryer is also available. The other end of the bathroom opens to a room filled with a beautiful white bathtub as well as a rain shower head. One can open up the shade to enjoy the view of the sea while soaking in the bathtub. Since this room offers full privacy, it is another plus point to be able to enjoy a good soak with a view. 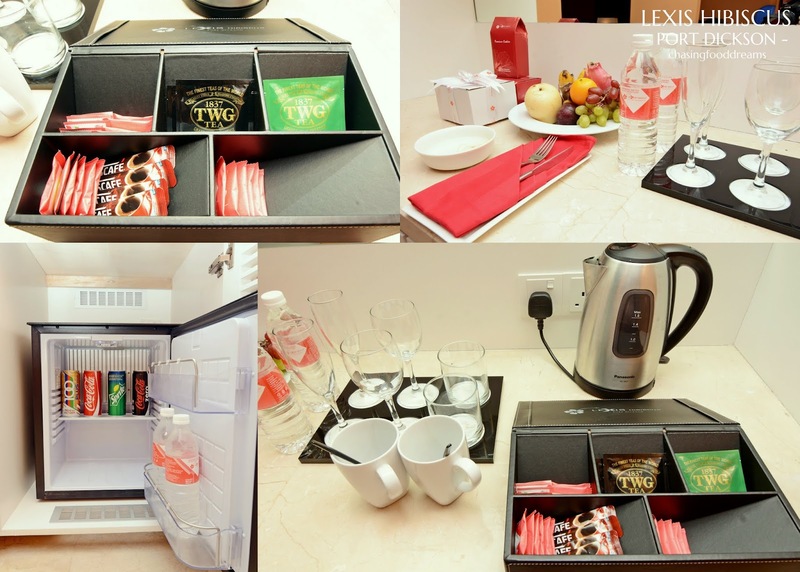 There at the earlier hallway we came in, the cabinet there holds the minibar (complimentary beverages), the usual coffee and tea (TWG no less! ), fruit basket, gift box of cookies and mineral water. A quick freshen up and it’s time for dinner! Lexis Hibiscus has few dining options from all-day dining to the popular Japanese cuisine as well as few small dining eateries from poolside bar to everything in between. The Lobby at the main building in the evening is so vibrantly lite up with its changing neon colors. I like how contemporary the whole ambiance is with the colors and the spaciousness. 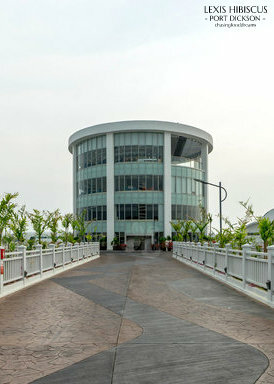 We opted for UMI Japanese restaurant, the Japanese eatery located at the ground level of main building in the resort. UMI, meaning ‘sea’, serves the epicurean cuisine of classic Japanese dishes. The restaurant is nicely spacious with minimal décor to offer the Japanese simplicity of a Zen ambiance. There is an open kitchen area at the end of the room if you wish to catch some live kitchen actions. Sashimi Moriawase (RM70), 5 types of the freshest cut of the sea is always a good start, especially when the seafood is thickly sliced and tasted of oceanic sweetness. Salmon, Butterfish, Tuna, Octopus and Scallop made up the dish. Chunks of crab meat with a tangy sauce on crispy wanton skin are topped with cheese and baked in Gyoza Kawa no Kani (RM15). Certainly an interesting appetizer and delicious in every bite! The Chawan Mushi (RM20) is beautifully done and comes with a crowning glory of a large sweet poached prawn. Velvety egg custard cooked till just set literally melts-in-the-mouth with savory pleasure. And how can we say no to sushi… Unagi Kani Sushi Maki (RM70) is quite a substantial size roll. Caramelized and smoky eel is draped over a crab and tamago egg roll before being finished with popping pleasures of masago, micro greens and light drizzle of mayo. Tori Moromiso (RM35) reminded me of teriyaki and yet it’s got a slightly different twist. Grilled marinated chicken thigh drenched generously in the sweet and umami teriyaki sauce before being topped with moreish barley miso concoction. Juicy and tender with that unctuously tasty and salty barley miso, the chicken was a favorite at our table that evening. Gindara Thyme Miso Yaki (RM80) is another dish worthy of an order. Thick cuts of cod marinated with chef’s miso sauce and broiled is superb on flavors and textures. For a twist, we also tried the Shitake no Gyuniku Kimchi Tare (RM60), sliced beef sautéed with assorted mushrooms and kimchi. Served with crispy golden sweet potato chips, this one is lightly spicy, tangy and moreish. A bowl of steamed rice would be the perfect accompaniment to this dish. Another must have at any Japanese meal, the Tempura Moriawase (RM45) may look deceptively simple but takes skills to show off the finishing result of golden lightly battered seafood and vegetables served with warm tempura sauce and grated radish. This one was indeed satisfying as the prawns were still moist and tender with just a light coating of the crispy batter. Japanese have also carved a name for themselves with their dish of garlic fried rice. We opted for a different version in the form of Shake Chahan (RM20). The fried rice with salmon flakes is superbly perfumed with lots of buttery garlicky flavors. Sprinkled with Sakura Denbu, a sweet and salty pink flaked fish, the fried rice is sublime. We polished this off happily as it was so yummy. My little one had Udon with Chicken Karaage, specifically whipped up by the kind chef since he don’t take prawns. Needless to say, he was slurping happily at the dish. Dinner ended on a high sweet note with sublime fruity Mango Pudding with Mango Sorbet and cubes of fresh mango and pomelo sacs. Despite being so full, I polished this off too because it was so deliciously fresh and fruity. UMI Japanese Restaurant offers a la carte, set menu as well as bento daily and buffets on the weekends. The pork free restaurant is open for lunch from 12noon to 2.30pm and dinner from 6.30pm to 10.30pm and is closed on Monday. For reservations, please call 06 - 660 2626 ext 2647. After dinner, we had a leisure stroll to enjoy the breeze before turning in. Our beds were even turned down when we arrived back in our rooms. Slippers set by the bed, bottled mineral water by the nightstand and a short and sweet note in wishing us a good night sleep.